Your countertops can make a lasting impression on guests that are visiting your home in the Toronto area. When someone walks into a room in your home, inevitably their gaze will come to rest on the surfaces as they assess the room. This includes countertops in your kitchen and bathroom mostly, but all surfaces are subject to scrutiny. For that reason it is a good idea to spend some time looking into your options for these areas in order to give your guests a true representation of who you are and your style. At Stone Masters we have a wide array of options for you to peruse online or in store. If you would prefer getting in person advice, one of our friendly and knowledgeable customer service representatives would be happy to walk you through all of the options for your project and budget. There is no countertop too large or too small for our specialty products that come in stunning travertine and Italian marble. These beautiful options come in slabs and tiles of varying sizes so all we need are some measurements and your preference in order to provide a comprehensive quote online or over the phone in a matter of minutes. We offer our marble and travertine in varying hues and can customize the slab to fit any space. When you make the decision to renovate a dated bathroom or one that no longer suits your tastes, Stone Masters is the best choice in and around the Toronto area to do the job. We take pride in offering the best materials and will bend over backwards to make sure your experience with us was the best. Our philosophy is that we don't just want your business, we want you to be so thrilled with our products and service that you brag about it to your friends. Our specialties are plentiful, and we can make bathroom countertops with your personal touches in mind, all we need is your input. For example, if a raised basin with an artisan finish is more your style, we can provide you with beautiful marble options in colours that evoke warmth or cool tones depending on where the countertop will be in your home. Should you just want a conventional sink and countertop, we can provide clean lines in pure, deep hues that add a classical look your guests will be raving about. When you are considering a change, give Stone Masters a shot are turning your bathroom into a beautiful oasis from the countertops on down to mosaic floor tiles we offer. Our primary choices for countertops (the most popular materials we sell in Toronto) are travertine and Italian marble. Below are the two categories of Italian marble and Travertine broken down into the colours we offer but if you don’t find what you’re looking for, please let us know and we will inquire with our suppliers about any new shades they may have unearthed recently. Simply put, when you work with us here at Stone Masters you will get a unique and quality product that cannot be found at the local furnishing store. Our slabs come from all over Europe and are rigorously inspected by our quality control experts to ensure the highest level of quality is shipped to our customers in the city of Toronto. 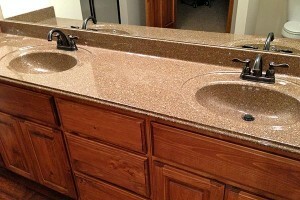 Stone Masters offers the highest quality bathroom countertops in Toronto. Whether you choose granite, marble, quartz, slate, or any other material for your bathroom, the countertop is always a focal point. Toronto homeowners always want the best, and the best is what you’ll find right here. 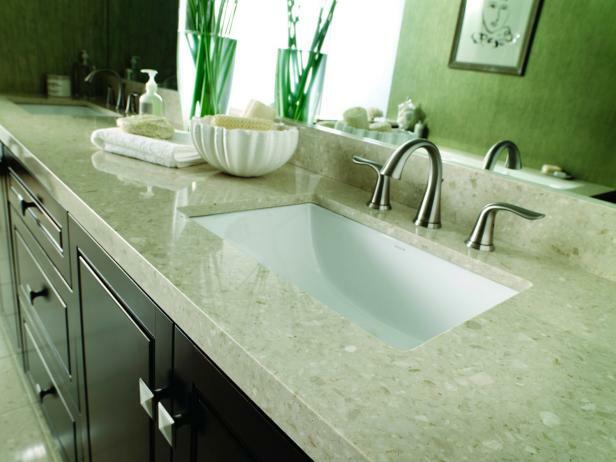 Vanity tops must play the dual role of serving as a work surface in the bathroom and being capable of withstanding soap, water, cosmetics, etc. When it comes to the bathroom, it’s crucial that you have highly durable material installed. There is no bathroom too large or too small for our specialty products. You have many beautiful options in slabs and tiles of varying colours and sizes. Our most popular materials for countertops include travertine and Italian marble. We can customize the slab to fit into your bathroom space. Whether you’re having new bathroom built, or plan on having an existing one renovated, we offer vanity tops that suit all design schemes and sizes. As mentioned above, travertine is a popular choice. It’s a misconception that travertine is impractical for bathrooms, due to its porous nature. The truth is that it CAN be used in bathrooms, just as long as it has the right finish and has been sealed properly. Travertine is not only beautiful, it’s also low maintenance. It’s easy to clean and hardly ever shows soap scum or water spots. All you’ll have to do is wipe the countertop down. Marble, of course, is a timeless choice. There’s not much in this world more beautiful than a slab of marble stone. For centuries, it was synonymous with wealth and luxury. Now, thanks to improvements in its production, marble is a bit more affordable. Anything less than the highest quality marble however, is susceptible to stains. For this reason, you must buy your countertop from a reliable manufacturer and provider. Stone Masters sells slabs that come from Europe. Each and every piece is rigorously inspected by quality control experts. We guarantee that our marble products are durable, high-quality, and beautiful. Take a look at our catalog to see various colours and designs we offer. 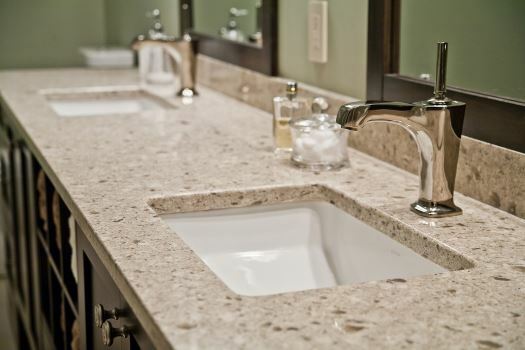 Whether your bathroom is classic, modern, rustic, etc., you should be able to find the ideal material for your countertop. Travertine – This material is visibly porous, giving it a textured, natural appearance. However, it can be sanded down and sealed to appear smoother. A few coats of sealant protects it from debris. Travertine is ideal if you want to add a warm colour to your bathroom. Finishes include honed, polished, brushed, tumbled, and saw cut. Marble – Marble is perhaps the most recognizable material for bathrooms. It can come as a single, solid colour, or with streaks of another colour running through it, such as white with black or gray veins. Some marble slabs even feature pink, yellow, green, or blue. Regardless of which colour you choose, you can expect marble to always have a very smooth texture. It’s the ideal choice if you want a classic, sophisticated look for your bathroom. Other materials, such as granite and quartz, are available as well. Take a look at the StoneMasters.ca catalogue to view your bathroom countertop options. If you don’t see what you’re looking for, simply contact us to let us know what kind of look you hope to achieve. We will help you build your dream bathroom.